The focus of my blog is to review book series and not individual novels, but writers are going to continue writing novels within a series even after I have done my review, so I plan on reviewing the individual novels as they come into circulation. Jeff Lindsay has just recently added book #8, Dexter is Dead, to the Dexter series. 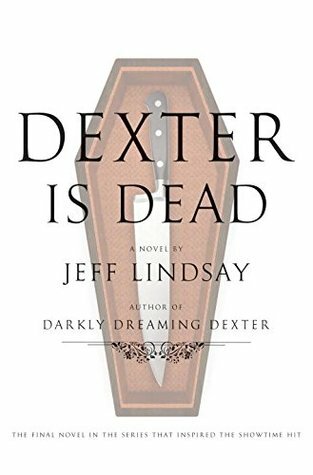 This is one review that I am sad to write and that is the ending to Jeff Lindsay’s Dexter series with his latest novel Dexter is Dead. I think that the title of the novel speaks for itself, as Dexter does truly die in this novel, though as I was reading, I couldn’t keep myself from wishing that maybe this wasn’t true. Even at the end, I thought that maybe Lindsay had left a possible opening to resurrect the series if he wanted to, but that is not to be. Jeff Lindsay has officially announced that the series is done and that he would like it to end now before the series becomes stale. This brings up a good point, when should a series end? As a reviewer on book series, I read every book in the series and I have found that some series do become quite stale over time but others seem to have an appeal that is quite enduring. So what is the secret? I think it comes down to how the characters are portrayed. If a series is dependent on one character, it can be difficult to maintain the series for long, as only so much can be done with a single character. I think the best series have multiple characters that grow and develop over time, with some characters entering the stage while others leave which is not much different than real life. This is why soap operas stay so popular even after decades of being televised. Which book series do you love and why do you think it is so endearing? I am going to miss that lovable sociopathic serial killer with his witty and humorous lines and the complicated messes that he often gets himself into but I understand why Jeff Lindsay wants to end the series. So all I can say is RIP Dexter. This is a must read for those Dexter fans out there that enjoy Lindsay’s witty prose. To learn more about the series check out Jeff Lindsay’s Dexter Series. Posted in Forensic Thriller.Tagged Book Review, Book Review Blog, Book Series, books, Dexter, Forensic Thriller, Jeff Lindsay, Thriller.